What is the first thing that comes into mind when we think about iron? The answer is energy. When we feel exhausted, stressed out or simply cringe at the idea of getting back up on our feet (literally), the only thing that can give us strength is iron. Interesting enough, iron deficiency is one of the most common nutrient shortage among the average population. Eating just meat in great amounts will not suddenly give us godly strength, nor is it healthy. So what should we do to ensure an adequate iron intake and prevent the dreaded anemia? Let’s find out. Iron is a dietary mineral of great importance for our general well-being. Its main function is transporting oxygen from our lungs to muscles and internal organs, in this order. About 30% of the iron we ingest is stored by our body in case there is a sudden shortage or unexpected rise in iron demands. But, at the same time, we may not always absorb all the iron we take in from food, which puts us at risk for a deficit and the side effects and health issues that come with it. In case of an iron deficiency or poor intake from diet, oxygen delivery slows down. 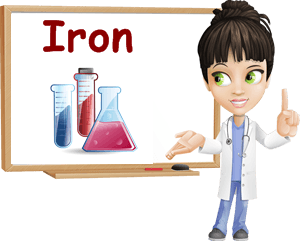 Symptoms such as fatigue, irritability or headaches are signs of low amounts of iron in the body and, consequently, poor oxygenation of blood, muscles, tissues in general. A more severe shortage (a deficiency-proper) will ultimately lead to anemia. As innocent as it may sound, if left untreated, anemia can have serious consequences on our health and may even prove life-threatening. Treating anemia can be done successfully by eating right and, if needed, taking some quality dietary supplements. Taking vitamin C can help increase the amount of iron our body absorbs and further contribute to improving the condition and our health. However, it’s true that some people are more likely to develop iron deficiency than others. Women, for instance, are more susceptible to suffer from iron deficiency and even anemia because of blood loss occurring monthly and during childbirth. Very important: the circulatory system is overstrained during pregnancy, which is why it is recommended that women increase their iron intake during this period. Pregnant women should thus talk to their doctor about the necessity of taking prenatal vitamins. Other categories at risk include people with poor diets and people suffering from ulcers, gastritis or even hemorrhoids and other similar medical conditions which presuppose blood loss. Each condition should be dealt with accordingly to minimize the risk for iron-caused anemia (read more about the best ways to deal with hemorrhoids and what foods to eat and to avoid for gastritis). Teenagers, both girls and boys, may suffer from an iron deficiency due to rapid growth associated with higher iron demands. Also, athletes, bodybuilders or running enthusiasts may be at risk because frequent exercise may lead to iron loss through perspiration. For example, perspiration, is a common cause for mineral deficiencies, causing us to lose significant amounts of important nutrients. Think about why professional athletes drink sports drinks, beverages with electrolytes and even vitamins. Sports drinks (not energy drinks, it is important to make the difference between the two) are meant to help keep those who participate in sports or intense physical exercise hydrated and replenish lost minerals. As a general rule, any form of excess mental or physical effort will most likely increase our demands of certain vitamins and minerals in particular by increasing our usage and, possibly, losses. Finally, iron absorption may be reduced as a result of excessive tea or coffee consumption. Coffee, for example, is known to reduce dietary mineral absorption and increase the risk for mineral deficiencies (read here the reasons why coffee is bad for you). Theoretically, a balanced and varied diet should meet all of our daily requirements of most essential nutrients, without the need of food supplements. In practice, however, we are all different and subjected to potential nutrient deficiencies for various reasons, iron included. With this in mind, it is important to know ourselves and learn to prevent and manage potential deficiencies wisely. This means learning to recognize the symptoms of, let’s say, iron deficiency and working to ensure an adequate intake, good absorption and prevent a future deficiency and its side effects. 1) Generalized weakness and fatigue. 4) Cold hands and feet. 5) Irregular heartbeats (feeling your heart suddenly beating faster for no apparent reason). 6) Tingling or pins and needles sensation in legs and arms, particularly feet and hands. Also the feeling a limb is falling asleep like when you sit on your leg for too long. 7) Palor or problems with appetite. It is important to note that these symptoms are not exclusive to iron deficiency or anemia (nor the only ones), hence the reason why it’s best to see a doctor before assuming anything. For example, cold hands and feet are indicative of poor blood circulation or hypothyroidism. Tingling, pins and needles sensation, the feeling a limb is falling asleep can be caused by a pronounced magnesium deficiency. Irregular heartbeats can occur because of potassium or magnesium deficiency, heat, sunstroke etc. So what can we do about it? As mentioned above, a good idea to help prevent, manage and treat an iron deficit is to up our intake of vitamin C. According to research, up to 1,000 mg (1 g) of vitamin C can significantly increase our body’s capacity to absorb dietary iron and thus prevent, manage and even help treat any potential deficiency. Supplementation can help meet daily dietary demands. Diet changes like eating more iron-rich foods can also help. But did you know there are different kinds of iron? There are actually two types of iron: non-heme iron found in plant food sources, but also meat, and heme iron found primarily in meat sources. Experts recommend having a good intake of foods rich in both forms of iron for ensuring good absorption and good health. Eating only meat or only vegetables is not a solution for iron deficiency. Some of the best food sources of the nutrient include: meat, beef in particular, but also fish and poultry, beans, lentils, chickpeas, spinach and other green leafy vegetables. Sometimes, iron supplements may be needed to ensure a good intake. Special medical conditions or predispositions may indeed require iron supplementation, but this should be recommended by a physician only following tests and diagnosis. I often eat spinach and beans, as well as fish, all rich sources of iron, but have also needed iron supplements. What I can tell you from my experience is that I have noticed better results when I took iron in combination with vitamin C and generally feel better when I have a high intake of vitamin C, probably because it helps increase the absorption of iron from food. Conclusion. If you suspect you have an iron deficiency, talk to a doctor about this and together look into the best solutions for treating the deficiency or anemia it may cause. Do not take iron supplements unless recommended by a doctor following a diagnosis of anemia. Otherwise, know that iron is an essential nutrient we cannot live without, but can get in sufficient amounts if we just eat right. And, as a tip, vitamin C increases iron absorption, contributing to better health.